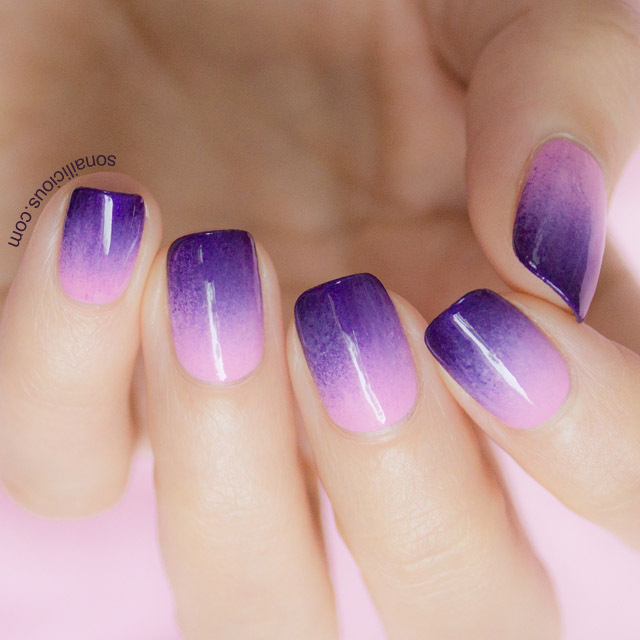 The ombre nails look has grown from being a trend to almost becoming a classic nail design. Cosmetic brands are also jumping in on the ombre trend bandwagon and offer various kits – from hair dies to nail polishes. Always keen to try anything new, we test drive for your one of the recent Fing’rs innovations – Fing’rs Edge Ombre Nail Kit! They come in three different shades purple, pink and blue. Today we’re testing purple! Like the look? Want to know more about the kit and where you can get it? Scroll down to read our full review! A Fing’rs Edge Ombre Nails Kit Contents: 5 Polishes 0.9 fl. oz. (27.5mL), and 1 sponge. Finish: Creme. 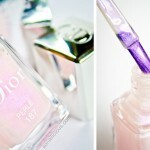 If you only wear polish, you’d definitely need a top coat for a glossy professional look. 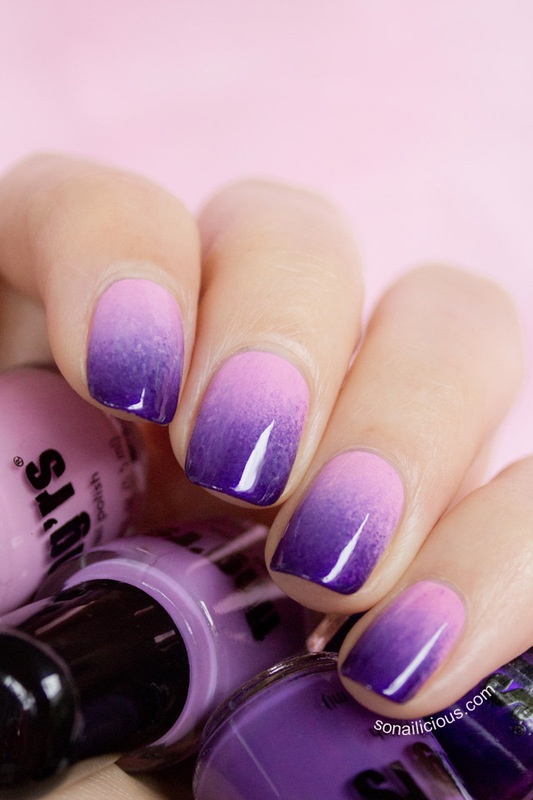 Any ombre nail art (whether it is a kit or not) should be always finished with a layer (or two) of top coat. I describe the ombre nails technique in great detail and why you need top coat it in this nail art book. Formula: Rich, highly pigmented formula – 2 coats is enough for full coverage. Fast drying. Not 3-free, so pregnant women note – you can’t use these! 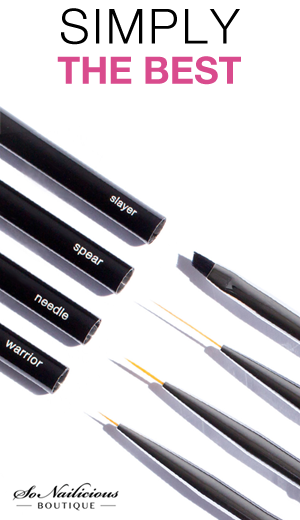 Brush: Thin and soft, the brush is not the easiest to work with but it’s still fine. Application: It was quite easy to create ombre nails with the polishes from the kit. The sponge provided isn’t great. I’d recommend replacing it with your own make-up sponge with finer pores for better application. As you can see on the close up photos, the colors didn’t quite blend with each other resulting in an unintentionally textured look. 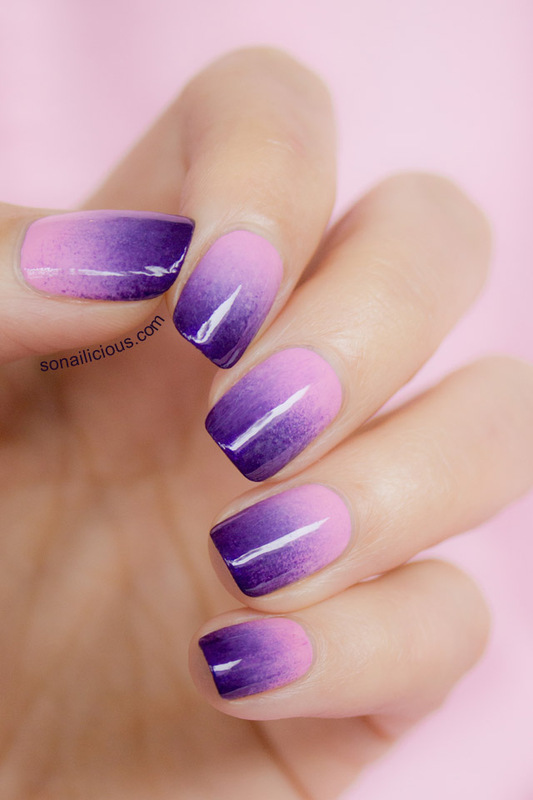 You can see how flawless, perfectly blended ombre nails should look here and here. Longevity: Even with a quality top coat our manicure lasted only 3 days. Extra notes: to make your manicure look flawless, use this sharp, angled nail art brush to clean up around your cuticles. Used:Fing’rs Edge Ombre Nails Kit in purple #32867, Essie Good To Go top coat. 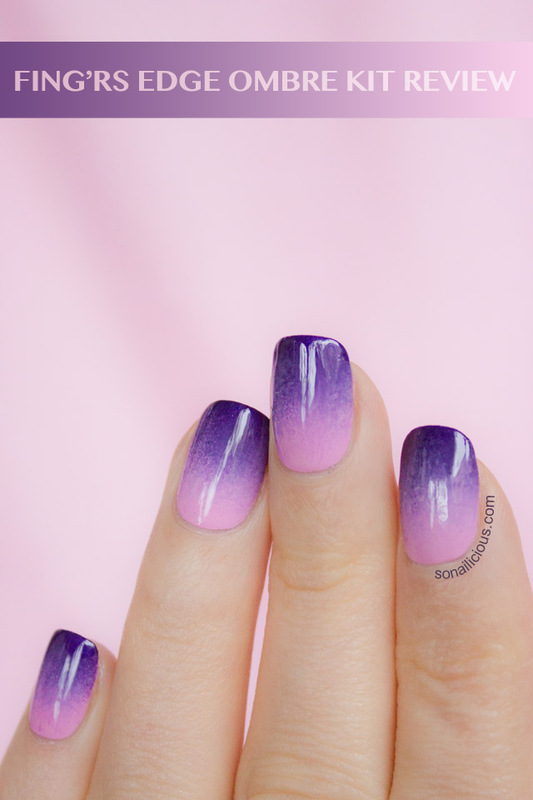 Overall Impression: Perfect for those who don’t have large nail polish collections and would like to have a few matching shades to create nice looking ombre or gradient nails. The shades are lovely and by getting this kit you’re basically adding 5 new matching shades to your nail polish collection. Though, the sponge from the kit must be replaced with a finer makeup sponge for a more even application of the gradient. 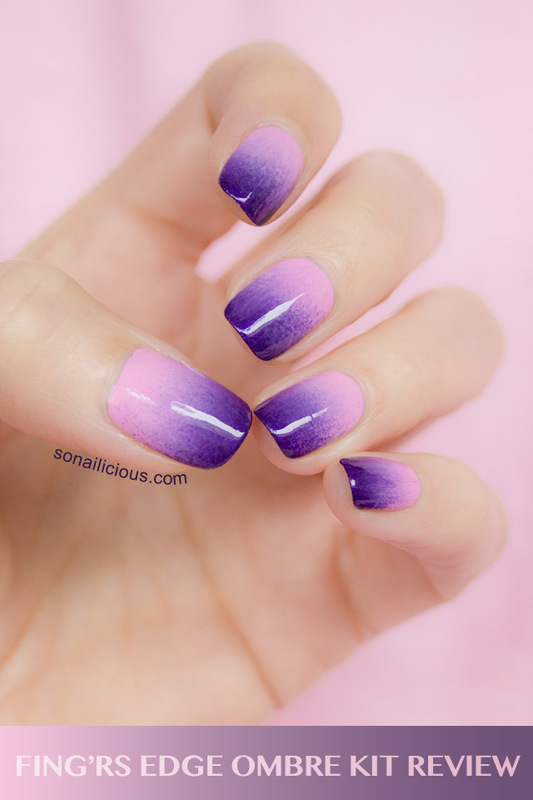 Also, a top coat is essential for ombre nails but it is missing from the the kit. By not including a top coat and not even mentioning it in the instructions, manufacturers are risking leaving their customers disappointed. 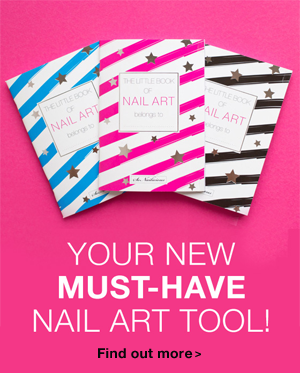 Overall, the kit would make a great gift for nail art beginners – lovely shades that are fun to play. Where to buy: in Australia in Priceline, $12.99 per kit, in the USA – Ulta. 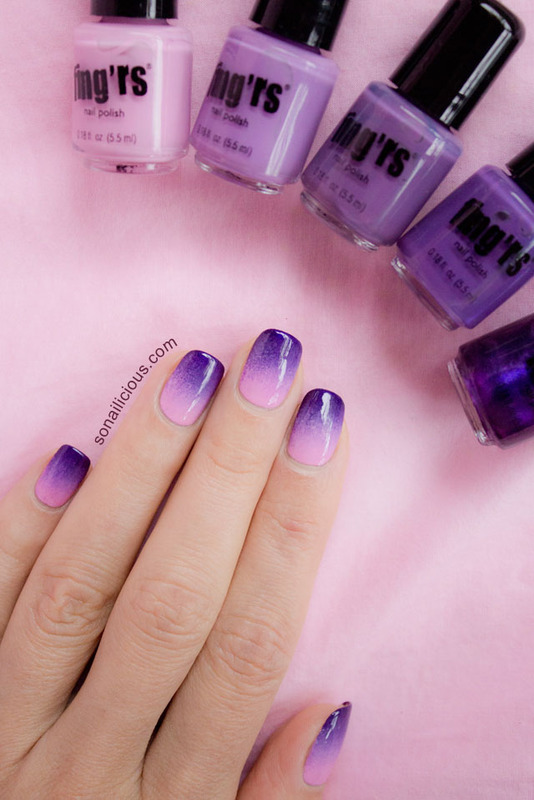 How do you like the idea of a special kit for creating ombre nails? Have you tried the Fing’rs Edge Ombre Nails kit or any other kits?